How could we forget Cabo Rojo and the dramatic Cabo Rojo Lighthouse of 1882. La Playuela beach here is a mainstay for all the locals. This beauty fronts a state forest. The lighthouse is worth seeing but be careful on the last bit of road here. It can quickly turn to mud after a little rain. 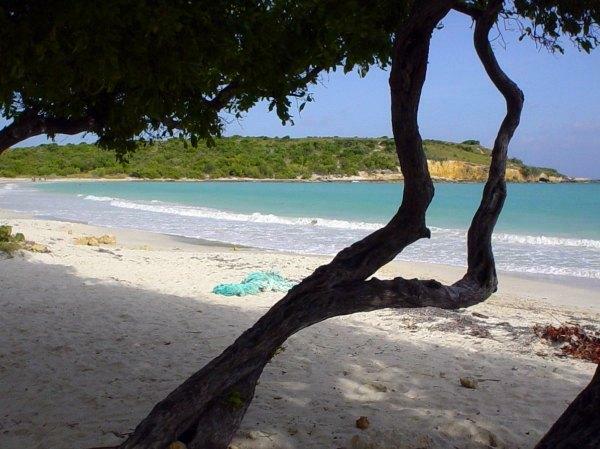 Boqueron is another beautiful beach in the area, just 30 minutes up the road from La Playuela. 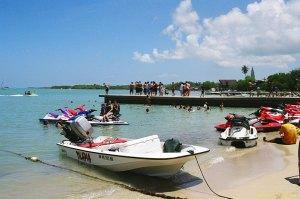 Boqueron has the best balneario in the area and 5 km of out of this world beach. The sand, like on most beaches of Puerto Rico, is off-white. This is because of the great rock content. Not too much coral. Try the middle section of Boqueron. We found a lot of sea grass on both sides of the beach. But do take the road down to the lighthouse and get out to see this beach. We’re not sure why they call the area Cabo Rojo, which means Red Cape, or Red Handle. However, some of the sunsets here are breathtaking. And there are many places to stay the night, if you’d like. Awaken the next day refreshed to check out both land and sea. You’re probably only going to see this once. Hey, and if the kiddos are along, you’re in for a treat. Boqueron has a nice playground with gazebos and a nice handicap sea ramp. Plus the bathrooms were downright clean! Do yourself a favor and if you’re out on this end of Puerto Rico, get to Cabo Rojo and drive along the coast. It’s spectacular and worth the time. will have an overwhelming experience. Beautiful accommodations abound nearby. Enjoy, enjoy and enjoy.